Ben Tallon: "How wrestling shaped my career as an illustrator"
A new book celebrating the visual history of British wrestling is soon to be published if it hits its crowdfunding target – freelance illustrator Ben Tallon reflects on how the sport’s “visual decadence” had a profound effect on his formative years. ITV’s World Of Sport British wrestling TV show was in its twilight years by the time I’d discovered sports entertainment. Yet, framed on the wall of my home today is a glorious original typeset poster featuring a towering Giant Haystacks, a deviant legend of the golden era of professional grappling in the UK. A new book, Grunts & Grapples, by Kerry William Purcell is currently being crowdfunded. It offers a visual history of the Golden Age of British Wrestling 1950-1990 and reminds me how much of an influence wrestling had on my own career. I was raised on Vince McMahon’s World Wrestling Entertainment (WWE). In the 1980s, his vision took everything that was magical from the US and UK’s gritty, lo-fi territorial promotions and amplified it on a global, mainstream scale. Crystalised and preserved for decades, the British scene has finally started to thaw and has lost none of its vitality, which is remembered fondly by those who were a part of it. 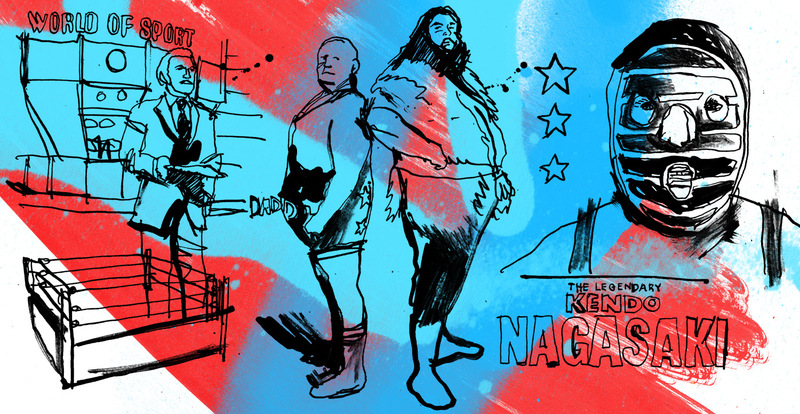 The resurgence is indebted to the many wrestling podcasts available today, loaded with rich stories of generations past and WWE’s recent UK title tournament, which also nods to the sports beginnings and brings it to a new generation. Both UK and US wrestling federations are underpinned by a visual decadence which is unique to pro wrestling. 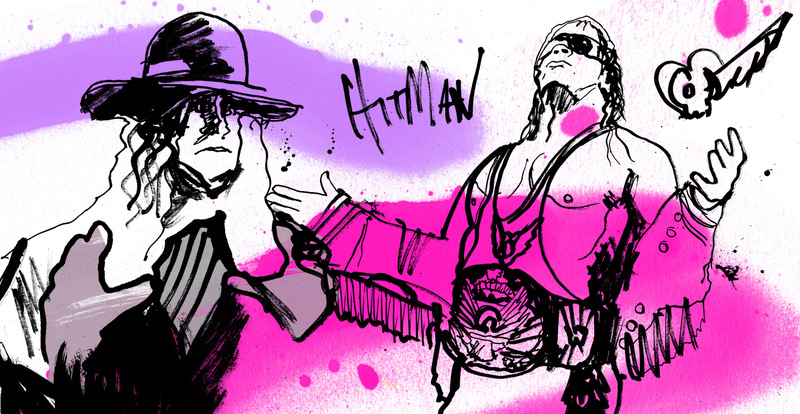 The yellow and red of Hulk Hogan, and the pink and black of Bret “Hitman” Hart lit up my childhood. Heroes and villains weighing in at 180kg, towering up to two-and-a-half metres tall and hailing from parts-unknown, took tiny imaginations and blew them up like bubble-gum. Elaborate costumes, electrifying promos and neon graphics on the big screen above the ring-entrance are still discussed to this day by those whose school lives were enriched with professional wrestling. Here, approaching 35 years of age, I’m more into it than ever, forced to explain this bizarre obsession to each of my fiancé’s visiting friends. My comparisons to other soap operas draw sniggers and derision. How could I possibly convey to a viewer of Eastenders that a muscle-bound Canadian man with dripping wet hair showing up on my screen wearing all-pink had a greater impact on my artistic development than anything else in my education? Then there’s the three-metre tall dead man who was painted on my bedroom wall from 1991-1996. My mother’s mural of The Undertaker – one of wrestling’s cult characters – dressed in all black, flanked by ravens and tombstones, replaced Winnie The Pooh and ushered in one of the most visually formative periods of my life. Cartoon characters took a back seat. As real as you and I, professional wrestlers fascinated me more than Spiderman. I spent long hours redesigning the logos, costumes and face paint of these goliaths. It became the vehicle through which I lovingly developed the creative skills that earn me a living today. Prior to the slick, production juggernaut that televised wrestling has become in the 21st century, the role of visuals was just as crucial. Without the benefit of computer-generated imagery (CGI), post-production and pyrotechnics, the basics of professional wrestling – a six-by-six-metre ring, a microphone, distinct costumes and powerful storytelling – was relied upon to win the emotional investment of fans. Were it not for the work of make-up artists and tailors who created the distinctive ring gear, the photographers who captured timeless moments, filmmakers who provided a window into this subculture and the graphic designers who crafted iconic posters, these often forgotten promotions could never have laid the beautiful foundations on which Vince McMahon built his empire. The unbelievable commitment to character authenticity shown by performers, maximising all of the aforementioned creative work infects wrestling fans during younger years and never lets go. Following a 1975 plane-crash, with “Nature Boy” Ric Flair in the hospital, his on-screen nemesis Wahoo McDaniels came to visit his real-life friend, sparking panicked calls by hospital staff to the police, terrified that he had come to ‘finish off’ Flair for good. With his elaborate peacock-style robes and bleach blonde hair, the Nature Boy would later reduce me to tears with his villainous ways before becoming a greater creative inspiration than any artist or designer. Today, with more than 40 projects for WWE under my belt, the landscape has changed. Social media and behind the scenes documentary shows cast light where there used to be mystique. Fans can share their visual tributes directly with their heroes and gain an intricate understanding of the hard work of the many creative people who bring this dazzling production to life every week on our TV screens. I visited the WWE headquarters in 2014 during a pilgrimage to Wrestlemania 30, seeing first hand the mind-blowing size of the operation, drinking in the spectacle of thousands of adults and kids alike dressed as characters old and new. In many ways, my work will always be informed by one of counter-culture’s strangest offerings. It is with great intrigue that I await Grunts & Grapples, hungry for this overdue education and celebration of the golden age of British professional wrestling. Publisher Unbound is currently crowdfunding online to make Grunts & Grapples a reality. Keep up with its progress here. Ben Tallon is a Design Week columnist, illustrator, art director and author of Champagne and Wax Crayons. He also hosts visual arts podcast Arrest All Mimics. You can follow him on Twitter at @bentallon and see his portfolio at http://bentallon.com. You can read his Freelance State of Mind columns here.